Building a portfolio can be overwhelming. There are thousands of mutual funds, ETFs, and stocks to choose from. There are also various ways to allocate your money between stocks, bonds, real estate, gold, and other investments. But there is also a simple allocation that will work for most people and get their portfolio up and running. This simple starter portfolio is a mix of US and international stocks, US and international bonds, and real estate. In fact, this starter portfolio covers nearly all US and international stocks and bonds that are worth owning — using Vanguard total market mutual funds and ETFs. And then I like to add a healthy dose of real estate investment trusts (REITs) to round out the portfolio. I’m a huge fan of Vanguard because of their low fees, high quality funds, and clients as owners. To clarify the clients as owners: you (the client) own the funds, and the funds own Vanguard. If you’re interested, you can read more about “Why Vanguard?”. This fund provides investors with exposure to the entire US stock market – including small, mid, and large-cap growth and value stocks. It is very broad and diverse, totaling over 3600 stocks! This fund includes all the big names such as Apple (AAPL), Google (now Alphabet) (GOOGL), Microsoft (MSFT), Exxon Mobile (XOM), Amazon (AMZN), JPMorgan Chase (JPM), and thousands of other big and small companies. The Vanguard Total International Stock Index funds offers investors a way to gain exposure to global markets, including both developed and emerging economies, such as those of Europe and Asia. Because this fund invests in global markets, there can be a lot of volatility, as some parts of the world have less stable economies than the US. But over the long term, having some international stock market exposure adds some diversification and potential benefits, especially when you look at emerging superpowers such as China and India. The Vanguard Total International Stock Market index fund invests in over 6000 stocks, including household names such as Royal Dutch Shell, Nestle, Samsung, Toyota, HSBC, and Unilever. The Vanguard Total Bond Market provides exposure to US investment grade bonds, including both corporate bonds and US government bonds. It also invests in bonds of varying maturities which helps to stabilize the fixed income this fund provides. The Vanguard Total Bond Market fund invests in over 8500 different bonds, the majority of which are US government. This broad US bond fund is a perfect complement to the US total stock market fund, providing fixed income and generally stable asset price, which can help when the stock market experiences a decline. The Vanguard Total International Bond Market index fund offers broad exposure to global (non US) investment grade government and corporate bonds. It operates similar to the Vanguard Total Bond fund covering US bonds, except the focus is on international bonds. The majority of the bonds in the Vanguard Total International Market fund are from more stable European countries and companies, but it also has exposure to the rest of the world. In total, it invests in over 4000 different international bonds. The Vanguard REIT Index fund invests in real estate trusts, which are companies that purchase office buildings, hotels, apartment buildings, and other real estate property. This fund will provide exposure to the real estate market, without you having to become a landlord yourself. There are two main types of REITs: Equity REITs and Mortgage REITs. Equity REITs generate income through the collection of rent on, and from sales of, the properties they own for the long-term. Mortgage REITs invest in mortgages or mortgage securities tied to commercial and residential properties. We know real estate and home prices can dramatically rise and fall, so this fund can see some volatility, but real estate investments have often performed differently than stocks and bonds. This REIT fund can offer additional diversification for a portfolio made up of stocks and bonds, and also adds diversification of asset classes, since this fund covers the real estate market. Deciding how much money to allocate these mutual funds or ETFs as part of your total portfolio is an interesting problem. The general recommendation by experts and analysts is that the closer you are to retirement age, the greater percentage of your portfolio should be fixed-income or bonds. In this example we will use a recommendation for younger people (20s-30s) with an 80/20 split, meaning 80% of the portfolio will be allocated towards stocks and 20% towards bonds. We will include real estate in the 80% stock mix. Here is an example 80/20 portfolio mix with the portfolio leaning more heavily towards US stocks and bonds, but keeping a sizable amount allocated to international markets. 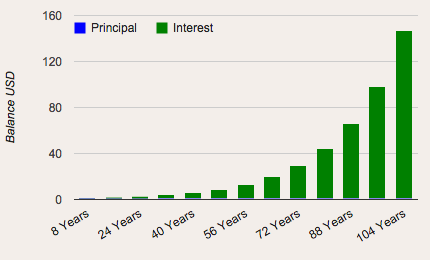 Compounding interest is one of the core principles of long term investing. The basic is the more often your investment compounds, the greater your investment will become, and your investments will grow at a faster rate over time. Compounding interest is also one of the basic ideas of the phrase “It’s about time in the market, not timing the market” — over time, as your investments compound interest, you will see greater and greater accelerated gains. Compound interest is interest added to the principal of a deposit or loan, so that the added interest also earns interest from then on. This addition of interest to the principal is called compounding. To put this more simply, compound interest is “interest on interest” which means your deposit will grow at a faster rate than with simple interest. 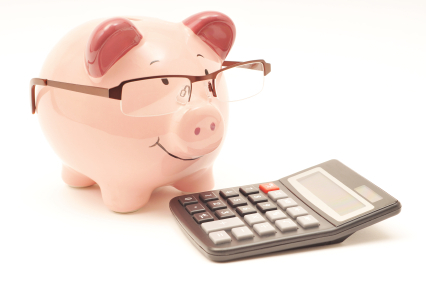 Here are two formulas you can use to calculate compounding interest yourself. 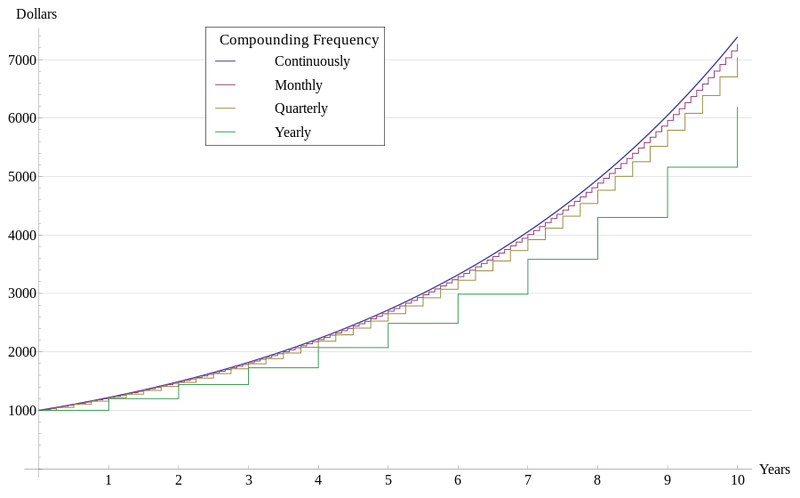 Important: Notice how compounding more often per year yields higher returns. You have invested $1 at a 5% interest rate which compounds once per year. Next year, the $1 investment would be worth $1.05 — a gain of $0.05. In 3 years, the initial $1 investment would be worth $1.158 — a gain of $0.0555 over the previous year. In 10 years, the initial $1 investment would be worth $1.623 — a total gain of $0.623. In 20 years, the initial $1 investment would be worth $2.653 — a total gain of $1.653. In 50 years, the initial $1 investment would be worth $11.467 — a total gain of $10.467! Important: Notice how the gains are increasing year over year and accelerating! Here are two graphs that further demonstrate the power of compounding interest. 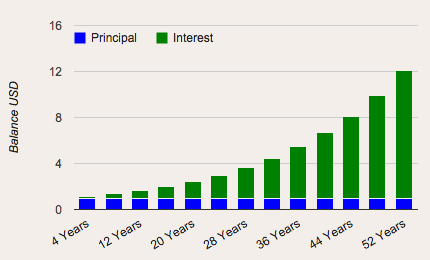 These graphs demonstrate the accelerating return rate you receive with compounding interest. The interest you’re making on your initial $1 investment is making its own interest — and it’s making more and more money over time — accelerating the returns. In this graph you will see compounding more often yields higher returns. Over time, the $1000 initial investment compounding yearly will return significantly less than $1000 compounding quarterly or monthly. Takeaway: Interest compounding more frequently will ultimately yield greater returns. An exchange-traded fund (ETF) is an investment fund traded on stock exchanges, much like stocks. An ETF holds assets such as stocks, commodities, or bonds, and trades close to its net asset value over the course of the trading day. Most ETFs track an index, such as a stock index or bond index. ETFs may be attractive as investments because of their low costs, tax efficiency, and stock-like features. For more information, see my previous article on ETFs: Exchange-Traded Funds (ETFs). Why Invest in Index ETFs? An Index ETF is an ETF that tracks a specific stock market index, such as the NASDAQ 100, S&P 500, or Dow Jones Industrial Average. This means when you buy an index ETF, you gain exposure to all the stocks that comprise the index. For example, if you bought QQQ, the NASDAQ 100 index ETF, you would gain exposure to Google (GOOG), Apple (AAPL), Tesla (TSLA), CostCo (COST), and all the other stocks currently part of the NASDAQ 100 index. The indexes are composed of a diverse set of stocks, so you automatically have exposure to various industries. If the index goes up, your index ETF will also go up. When a company in the index pays a dividend, your ETF will also pay a dividend. There are a number of advantages and benefits to buying index ETFs. First, you are diversifying your holdings because the ETF is a basket of other stocks. You are also diversifying your risk exposure. A sharp decline of a single stock will not translate in to a sharp decline of the ETF because the other components in the ETF will decrease the loss and risk. If a stock in the ETF pays a dividend, you will receive a share of the dividend through the ETF. If the index the ETF tracks increases in value, your ETF will also increase in value. If you are new to investing and trading and you are looking for a good online stock broker to use, my article Choosing An Online Stock Broker may help you decide. Choosing an online stock broker is a guide to help you find the best online stock broker for your needs and requirements. Read the full article at Trading Winner: Choosing An Online Stock Broker. You can get in on the hot commodities and precious metals actions without owning physical metals such as gold and silver coins. Exchange Traded Funds (ETFs) allow you to invest in commodities and precious metals, like Gold and Silver, and watch your ETF investment grow as the prices of gold, silver, and other commodities rise. For those unfamiliar with Exchange Traded Funds, or ETFs, read my Exchange-Traded Funds – ETF on my Investing Winner blog. ETFs have many advantages and can benefit every stock trader and investor. People have recently asked me about an exchange traded fund based on the price of Silver. One such silver ETF is the IShares Silver ETF, with ticker symbol SLV (ETF: SLV). The SLV etf is sponsored by Barclay’s Global Investors and has been in the works for more than a year. Silver’s big brother gold also has an ETF in active trading, ticker symbol GLD. Investors and traders alike have been waiting for the creation of the silver ETF. We can see their support and liking of the new SLV etf with the 7% jump in the price of the ETF, which was introduced on the stock markets on Friday, April 28, 2006. Global investors are predicting both silver and gold will continue to rise even more than they have in the past year, due to concerns over Iran’s nuclear program, weakened dollar, gas and oil prices, and buying of precious metals by world banks.